This 500+ horsepower, rear-wheel-drive, lightweight, 1996 Porsche 993 Turbo is not for the purists, those looking for all-original, no-stories cars, nor those satisfied with stock performance. It is instead—and without apology—a road-legal, track day, air-cooled 911 that has been highly modified by it current owner. 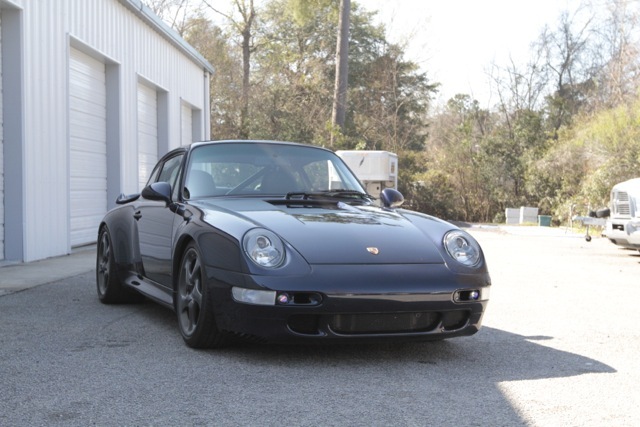 The 993 is available at our Charleston, SC facility for $$$$$. This 993 Turbo’s stout performance, which will be covered in detail shortly, is the good news. The bad news is that this car wouldn’t have come to be, were it not for two accidents. The first came sometime prior to the current owner’s purchase in 2007. According to the current owner, the previous owner apparently flicked his cigarette out the 993’s window. Except it didn’t go out the window, it went into the back seat. The resulting interior fire burned the leather but not the chassis, and the insurance company totaled the car instead of incurring the significant cost of a complete Porsche Turbo interior. Oklahoma Foreign bought the car, fixed the interior and sold the 993 to the current owner in 2007. 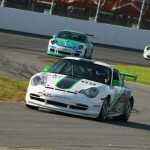 In 2009, the current owner decided it was time to modify the Turbo with an eye towards track day events. 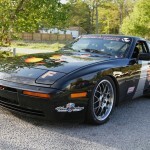 Autometrics Motorsports was commissioned to bump the engine from 3.6 to 3.8 liters and convert the chassis from all wheel drive to rear wheel drive. 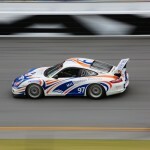 The operation was a spare no expense affair including Carrillo connecting rods, Wossner pistons and cylinders, extensive machining, the addition of a 996 GT3 Cup limited slip differential, and the removal of the driveshaft, front differential, halfshafts and other all-wheel-drive hardware. The result was a significant increase in horsepower and decrease in curb weight. The second accident came in 2010. The current owner was driving in normal traffic conditions when he was cutoff by an elderly lady. The front of the 993 struck her car. The front fenders and hood were damaged and the airbags deployed. After the accident the 993 tub was thoroughly inspected and the decision was made to rebuild. 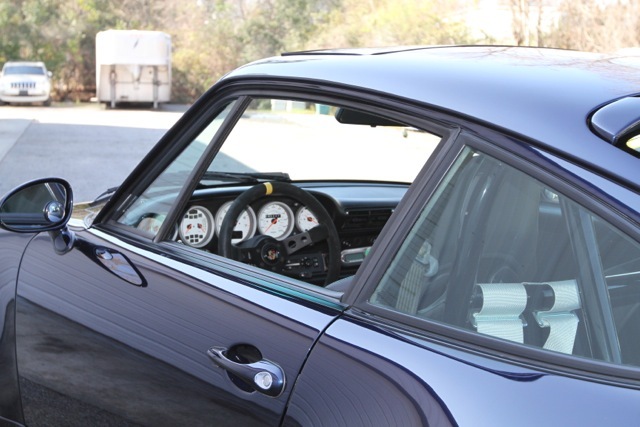 The 993 was taken to the highly regarded Elite Custom Paint in Simpsonville, SC. Euro front and rear bumpers were installed, the damaged fenders and hood were replaced, and the entire car was repainted in the original iris blue metallic color using Spies Hecker paint. Finally, the new paint was protected with the installation of a 3M clear bra across the front of the car. Shortly after taking delivery of the freshly repaired Turbo, the current owner ordered and personally installed two new Garrett GT28 turbo’s, EVO billet-aluminum recirculation valves, a complete Fabspeed exhaust, an HKS boost controller, a custom ECU reflash and a complete S-Car-Go plumbing and fuel regulation kit. He bolstered the Turbo’s cooling system with the addition of three, Mocal front-mount oil coolers plumbed with braided stainless steel and AN fittings, and working in conjunction with the stock oil cooler. Additionally, he further modified the Turbo with hollow-spoke 996 wheels, Bilstein PSS9 Shocks and Tarett rear toe links that allow a more aggressive alignment than stock. Inside, the 993 Turbo’s interior has been modified with just enough creature comforts in place to commute to track or office. 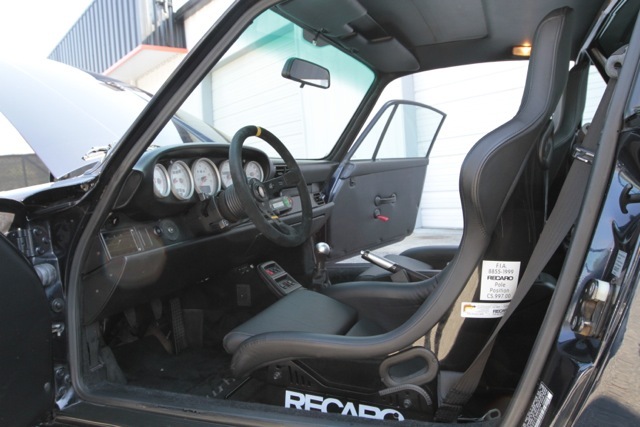 Leather-covered Recaro seats with Simpson race harnesses hold driver and passenger in place just below the DAS rollbar, RS lightweight panels adorn the doors, custom wood panels line the driver and passenger side floors and Porsche carbon fiber covers the shift and handbrake levers. High quality German vinyl covers most other interior surfaces except the backseat, which has been removed to save weight. 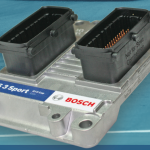 Finally, a track mate system has taken the place of the stock radio. The 993 Turbo comes with two sets of hollow spoke 996 Turbo wheels. The set currently on the car wears Yokohama rubber but requires the replacement of both rear tires. The second set of wheels, used on track, wears a set of highly-worn Michelin Pilot Sports that may or may not have one session’s worth of tread left. 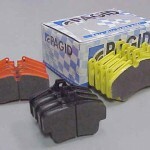 The current owner indicates the brake rotors have seen just 10k miles and that, while the currently installed pads are worn, another set with 75% friction material accompanies the car. The 993 also comes with a digital copy of the service manual, and the removed items including the radio, 4 wheel drive system, and catalytic converters. The 993 Turbo starts easily, settles into a smooth idle quickly and pulls strongly once proper engine temp is attained. There is a small issue with the oil pressure spiking when throttle is applied and the engine has not reached proper temp. This can be avoided by allowing the car to warm, or it can be investigated by Autometrics Motorsports technicians at the regular shop rate. The current owner has performed minor services himself at the regular scheduled intervals and put 21,000 miles on the car during his ownership. The car’s total mileage is just shy of 143,000. With new business obligations taking a good deal of his time and a relocation to a property with limited car storage, he has reluctantly decided to sell. The car is currently kept in one of our conditioned warehouses and interested parties are encouraged to inspect the car in person at our Charleston, SC facility.